Du’Notte Travel Agency is a fictional company that provides tourists with “alternative” plans for adventure, vacation, and relaxation, all without leaving the home. Aesthetically driven travel pamphlets promote all the indoor travel locations. Though the design and description might appear pristine, the photographic imagery of these places provide a stark contrast. It appears monsters and messes occupy the vacationing spots! The plant was an essential addition, obviously. The concept is satire based on Emerson’s theories surrounding travel and how “the wise man stays at home,” mixed with the aesthetics of 50s style travel guides. RISO printed duotone postcards, RISO printed business cards, photo prints of the locations, an itinerary and staple-bound travel pamphlets complete the vibe of the 50s travel agent desk. To create the photographs to add to my fake travel guides, I decided to create my own scenes using doll furniture and sculptures I created. I felt it added to the uncanny-valley, alternate universe feel I was going for. This travel desk setup had to be from some freaky alternate universe where the word “stay-cation” was taken to a strange extreme, and miniatures helped to create that sensation. 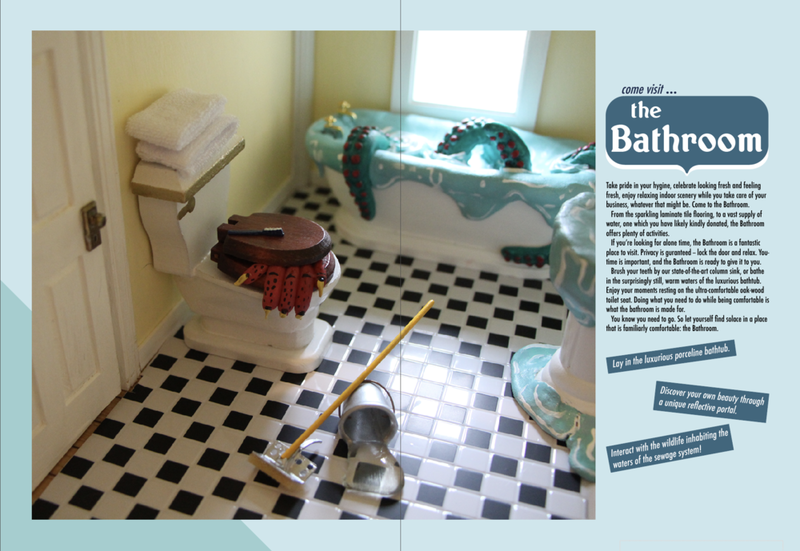 Sample spread from the Bathroom travel guide. Sample spread from the Bedroom travel guide. Sample spread from the Kitchen travel guide. Sample itinerary from within the brown folder on the desk.